A lonely man with his $1,000 Baby Blue. One of the standout moments in the trailers for Jurassic World: Fallen Kingdom was footage of Chris Pratt’s character training baby velociraptors. Do they become lethal killing machines when fully grown? Yes. But as babies? They’re adorable! Who wouldn’t want a tiny velociraptor of their own? Well, now, short of finding some dino-DNA and engineering one yourself, you can. 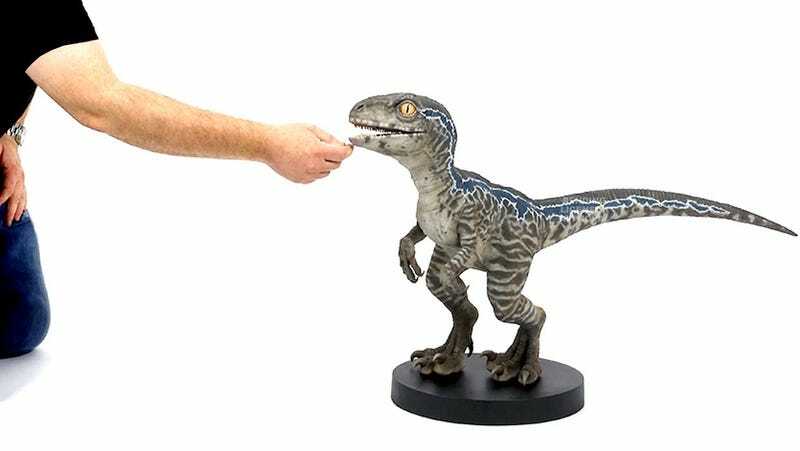 Chronicle Collectibles is now taking pre-orders for a limited edition, full-sized replica of Baby Blue the raptor from Jurassic World: Fallen Kingdom. It’s about 38 inches long and made out of polyresin, designed directly from Industrial Light and Magic’s digital assets. Of course, that kind of quality doesn’t come cheap, so the piece runs $1,000. Here are some more photos. A side view of Blue. A front view of Blue. For more information and to pre-order, visit this link.